Italian Table- 1940's. 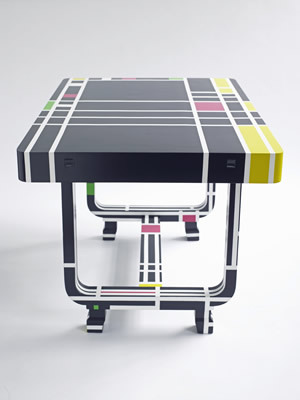 The artist's "Mondrian" inspired design particularly suits this table. She restored and hand painted this piece as with all her work. The artist loves to work with period furniture because of the history attached to it and she really enjoys the process of transforming these pieces into something completely different. I wanted to create unique works, furniture that exists as works of art whilst still being functional. I breathe new life into classic pieces, restoring and reusing furniture which would otherwise be overlooked. Working with a fresh approach and truly original designs, I transform them into totally unique products for the top end of the market. My work definitely crosses between the boundaries of art and design and my physical work on the pieces involves craftsmanship. I love working in this way and my approach to my work is driven by the excitement and passion that I feel creating and being surrounded by beautiful objects. My aim is to communicate this sense to others so that they can experience the same enjoyment from my work.